SUWANEE, Ga., Jan. 4, 2017 /PRNewswire/ -- Today, ARRIS International plc (NASDAQ:ARRS) announced the ARRIS Secure Home Gateway portfolio, which will combine Intel™ Security's expertise in internet security with ARRIS's leading broadband solutions. ARRIS's Secure Home Gateway portfolio is the first to embed the McAfee® Secure Home Platform by Intel Security — for powerful, seamless, and hassle-free security for all devices connected to the network, including IoT devices (such as gaming consoles, connected cameras, wearables, and Smart TVs and appliances). Each gateway (cable modem & Wi-Fi® router) in the new SURFboard® Secure Home Gateway portfolio will integrate the new McAfee security platform directly into the device and carry the designation: "McAfee Secure Home Internet." ARRIS gateways with McAfee Secure Home Internet will offer network-level security that seamlessly protects all devices connected to the home network against emerging threats like viruses, malware, and phishing scams. They will achieve this by acting like a home security system, managing the flow of data between the Internet and the home's connected devices to ensure that users are guarded against known threats. A simple-to-use mobile app will allow for convenient customization, enabling consumers to easily manage their home gateway security settings. Smart security: Hassle-free protection uses the cloud to protect internet-connected devices in the home against the latest malware and phishing and identity scams. Seamless app management: Access and manage features including IoT device protection, device identification, and pausing internet access. Receive real-time alerts about potential vulnerabilities, new connected devices entering the home, and more. Robust parental controls: Easily protect your whole family by setting individual schedules and restrictions for every device and user in your home. "ARRIS's new Secure Home Gateway portfolio embodies our commitment to delivering leading broadband and Wi-Fi performance with seamless security for today's connected home," said Sandy Howe, SVP and GM, Consumer Products Group at ARRIS. "Our gateways with McAfee Secure Home Internet will act like a home security system for your connected devices. They combine our industry-leading technology with the latest McAfee security to deliver powerful, network-level protection that guards your family, your devices, and your data against the latest Internet threats, while delivering the next era of broadband and entertainment experiences." "We live in a time where consumers are constantly connecting new devices in their home to the internet. With this unprecedented connectivity comes increased risk," said John Giamatteo, CVP and GM at Intel Security. "It's more important than ever to ensure consumers have proper security controls in place to enjoy the benefits of this new connected technology while minimizing the risk. ARRIS shares our vision of protecting consumers in the connected home, and the inclusion of the McAfee Secure Home Platform in their gateway portfolio delivers on this vision." The ARRIS SURFboard SBG7580-AC will be the first device to embed the McAfee Secure Home Platform. The SURFboard SBG7580-AC with McAfee Secure Home Internet is expected to become available around the first half of 2017 at Amazon, Best Buy (in-store and online), and Surfboard.com. Consumers will be able to simply activate the McAfee security through an online app ("ARRIS McAfee Secure Home Internet") that will be available in the Google Play and Apple App Store. ARRIS will announce pricing for McAfee Secure Home Internet at launch. Future ARRIS broadband devices will also feature this embedded security—adding to the portfolio of Secure Home Gateway solutions. To extend McAfee Secure Home Internet's network-level security benefits beyond the home Wi-Fi network, consumers can use popular device-level security products such as McAfee Live Safe™. 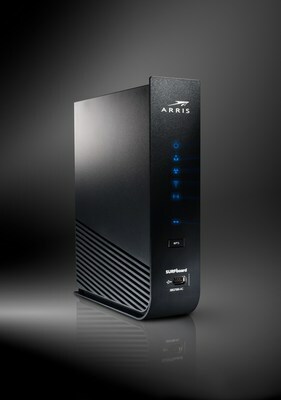 ARRIS will demonstrate the SBG7580-AC with McAfee Secure Home Internet at CES in its private suite. The SURFboard SBG7580-AC gateway combines a DOCSIS 3.0 modem, 802.11AC Wi-Fi Router, and 4-Port Gigabit Ethernet Router, all in one device. With internet download speeds up to 1.4 Gbps* and Wi-Fi speeds up to 1750 Mbps it's the ideal solution to power busy home networks. Plus, with 4-Gigabit Ethernet ports it's perfect for HD video streaming and online gaming. ARRIS, the ARRIS Logo, and the SURFboard Logo are trademarks or registered trademarks of ARRIS Enterprises, LLC. Intel Security, McAfee and their respective logos are trademarks of Intel Corporation or its subsidiaries in the U.S. and/or other countries. All other trademarks are the property of their respective owners. © ARRIS Enterprises, LLC. 2016. All rights reserved. * Actual rates may vary dependent on a number of factors including, but not limited to: the services offered by cable service providers, network traffic, computer equipment, type of server, number of connections to server, and availability of Internet router(s).